With this book as a companion, readers will learn to view life's transitions as places from which to grow, rather than causes for anxiety. To order The Art of Uncertainty from Amazon.com, click here! What inspired you to write a book on the topic on uncertainty? Was it difficult to pin down something that is, by definition, so ambiguous? I was inspired to write The Art of Uncertainty because one of the core elements of my teaching has always been that we were put here to grow and express life in ever greater ways, and that can never happen if we are stuck in the rut. We can't create anything new from within the field of what we already know. The only way to honor the Life Force that surges through us is to step into the mystery of the unknown where all possibilities exist, and allow Its current to take us where It will, trusting that It knows better than we where that is and how to get us there. This is not to say we don't play a major role in what that may look like, because if we are fully engaged in the present moment, we enter into the flow as a conscious co-creator with a universe expanding at the speed of light. This is easier to do when we understand that living in the mystery really is an art form of which we can all become masters. It just requires a willingness to come to the edge. In my mind, there is really nothing ambiguous about uncertainty. Depending on one's perspective and attachment to the need to control one's own destiny, the idea of living life in the mystery of uncertainty will bring on distinct feelings of either sheer panic or unprecedented freedom. Since we are always at choice, I choose to associate living in the mystery of uncertainty with freedom; freedom to grow, freedom to express new ideas, freedom to experience new possibilities, freedom to let go of what no longer serves me in healthy ways, and freedom change my mind. I have lived much of my adult life with the awareness that life truly is a mystery whether we like it or not, and that most people simply pretend, wish, or hope that this is not the case--but it is. You ask readers to "Live in the mystery of life and love it." That is easier said than done. Which mysteries are lingering in your life and how have you bonded with them? The better question is which mysteries are not lingering in my life. This is exactly the point of the book: Every moment of every day is a lingering mystery so why not learn to love it. There is no area of my life that is not a total mystery every moment of every day: We construct this fantasy in our heads that when we arise each morning the day ahead is a known factor and it clearly is not. The mysteries lingering in my life are exactly the same mysteries that linger in your life. The only difference is, while you may not want to deal with them because it creates such anxiety and suffering, I have learned to "be" in the mystery as it unfolds because I have learned that to resist it only causes more suffering and angst. Do I know what is going to happen tomorrow or, for that matter, five minutes from now? Do you? Of course that is a rhetorical question because we all know the answer--we just don't want to embrace it. I have bonded with the mystery of uncertainty in my life to the best of my ability by embracing it, not resisting it, and being present with it as it reveals itself in every sacred second. This is a very liberating way to live if you are willing to come to the edge of "what is" and trust there is something within you that knows how to deal with it. You compare us to baby birds who don't know they can fly until they are pushed from the nest. Which life events become that "push" in our lives? The metaphor of being pushed out of the nest, a.k.a our comfort zone, is something most people can relate to because it happens on a regular basis--we just tend to ignore it until it becomes less painful to change than stay where we are. There is no area of our lives where we are not forced to step to the edge of uncertainty at one point or another. This includes our relationships, careers, physical health, finances, and so on. We need only look to anyone who has been in a long term relationship or job which came to an abrupt end. The same could be said about someone receiving an unfavorable medical diagnosis. In that moment, they are pushed to the very edge of their comfort zone and forced to deal with the uncertainty of what tomorrow may or may not bring. Still others will be forced to come to the edge of their nest because they are called from within--there is an inner knowing there is more to do...more to be, and the only way to discover what that is to come to the edge of that which is yet to be and learn over. In the birds case it comes down to fly or die. As they outgrow their comfortable nest they have no choice. However, with us we do have a choice. Whether we are pushed to the edge of uncertainty by inspiration or desperation, by pleasure or pain, the practice is to remember that the same Intelligence that lives within the bird that knows how to fly lives within us as well. In what situations would the tactics you recommend in the book be helpful? Life itself is the laboratory to discover how to live in the mystery of uncertainty. There is no area of our lives where, at some point, a situation can or will arise that invites us to come closer to the edge on the unknown and peek over. The "situations" are inherent in life itself. The tactics offered in the book are all simple but not always easy to initiate and follow through on. However, they are accessible and applicable to anyone who is willing. Take a look at your own life and see where there is a need to grow, change or create something new. Whatever the situation, the resolution will always be the same; coming to the edge of what we don't know and trusting there is something within us that does know, and then following its lead. The Art of Uncertainty is a guide book to assist those who are ready to see shift happen somewhere in their life and are willing to come to the edge of that which is yet to be. Your work is inspired by a diverse assortment of inspiring spiritual luminaries. Which of them remain most important to you and what have you learned from their work? I have been greatly inspired by the ancients and well as the contemporary thinkers. From Hermes, Moses, Buddha, and Jesus, to Emerson, Thoreau, Ernest Holmes, Charles Fillmore, Mary Baker Eddy, Emma Curtis Hopkins, Gary Zukav, Deepak Chopra, and so many others. While the messengers are all quite uniquely different their message has that common thread of truth running through it: Life is fundamentally a spiritual adventure and we were put here to experience that adventure, not sit on the metaphoric side of the road (aka the rut) and watch the parade of infinite possibilities that lie in the unknown pass us by. You write that when we ignore universal Law, our ignorance has automatic consequences. (pg. 97) What are those consequences? How can we be more aware, and avoid them? We live in a universe that operates solely on an impartial, nonjudgmental, Law of Cause and Effect. We are continually becoming cause to our own effect by means of our deepest thoughts and beliefs. If, out of ignorance of how the Law works, we misuse it, we suffer the consequences. In other words we are not punished "for" our mistakes, but rather, "by them." How we can become more aware of the Law of Cause and Effect is to be mindful that the universe "has ears" and the only word it knows is "Yes." Mindfulness is a major topic in the Art of Uncertainty and it one of the best tools at our disposal when it comes to using the Law in beneficent and meaningful ways to create a life truly worth living. The book recommends patience as a way to outlast uncertainty. What strategies can we use to cultivate patience in times of confusion? I offer this insight which is quoted from one the many Mindfulness Practices in The Art of Uncertainty: "Be mindful to notice whether you are at ease or if there is a sense of stress attached to whatever you are doing in any given moment. Spend time outside each day and simply observe nature. Witness the effortlessness in which Life patiently unfolds right before your eyes. Look and listen for signs in nature of forced effort and struggle; you will notice none. Then, align with that Energy of ease and see how it can filter into your life experience each day." 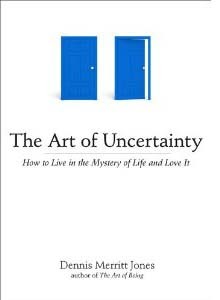 Dennis was prompted to write the The Art of Uncertainty - How to Live in the Mystery of Life and Love It for two reasons. First were the obvious challenges so many people are facing which brings them to the edge of "not knowing" what tomorrow holds. Second, he believes many are ready to evolve in ways that require major life style choices and changes but may not know how to initiate that process. The focus of the book offers practical, spiritual tools that will help anyone who is brought to the edge of uncertainty to lean over with faith and confidence, knowing there is something within them that knows how to transcend any fear about the future. There is no area of our lives where we are not forced to step onto the pathway of uncertainty at one point or another whether it be in our relationships, our careers, our physical health or our finances. Why not enter the mystery consciously and intentionally every day? From the day we were born--when we entered the mystery of life--until the day we leave the planet, the only way to grow is to step into the unknown time after time after time. The Art of Uncertainty is about learning to use our time spent in this Earth School wisely. Regardless of your level of education, the ultimate school of life itself is always in session. As we make living in the mystery a daily practice, we prepare ourselves for the adventure regardless of whether we are pushed onto the pathway of uncertainty by inspiration or desperation, or by pleasure or pain. In either case, we shall discover it is a journey we can learn to love. With its "Points to Ponder" and "Mindfulness Practices" at the end of each chapter you can consider The Art of Uncertainty the perfect guidebook on how to step into the mystery of life and love it.